The breath freshening agents eucalyptus, cinnamon and parsley seed oil, continue the fight against bad breath by targeting it at it's source, in the stomach. So even after mealtimes these treats continue to be effective! My mums dog loves these and they are not too hard for her to chew.Good for the older dog with fewer teeth.Keeps her breath fresh too. Fab!! 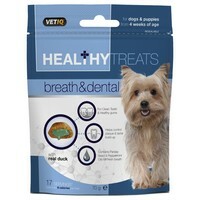 my dog loves these and just wants more so very easy way to keep her teeth clean and bad breath at bay! would deffo buy again! and as always fab fast delivery with VetUK!! This is a great product after only two weeks no more bad breath teeth are getting cleaner our little canine terrier loves them.